What Is The Difference Between CBD & THC and How I Used Them To Fire Big Pharma. It seems like everywhere you go, somebody is talking about CBD. But what exactly is it and how is it different than its cousin THC? CBD & THC are just two of over 100 Cannabinoids found in the Cannabis Plant. CBD stands for Cannabodial while THC stands for Tetrahydrocannabinol. They have almost the exact same chemical make up however they couldn’t be more different. Here are a few key differences between the two. The first and most important distinction is that THC will get you high while CBD will not. In fact, CBD is known as an Antipsychotic which means it is used to reduce the effects of THC and other opiates. Another significant difference between the two is that THC generally comes from the Marijuana plant while CBD comes from the Hemp Plant. You will find small amounts of THC in the hemp plant just as you will find small amounts of CBD in a marijuana plant. However, Marijuana growers will breed out the CBD in their plants because CBD takes away the high caused by THC and CBD growers will breed out the THC in their plants because they cannot have more than .3% THC in their plants in order to be considered legal hemp. This is a very important fact worth repeating. In order for Hemp to be legal, it must have less than .3% THC. The laws on the legality between THC and CBD are quite different as well. THC is Federally Illegal yet legal on a state by state basis. CBD on the other hand is now Federally legal thanks to the 2018 Farm Bill, yet illegal on a state by state basis. This can be quite confusing for the average person. You will want to check the legality of CBD in your state. 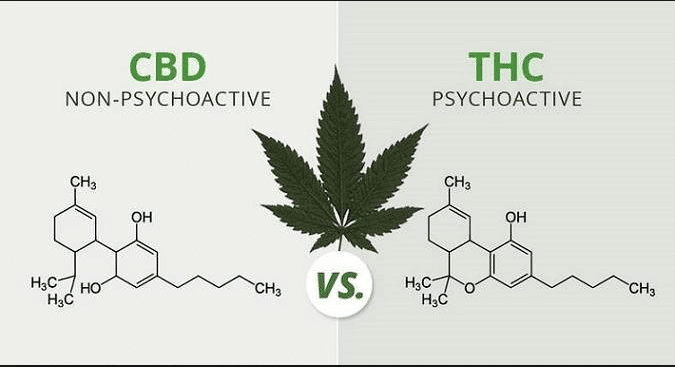 Now let’s take a look at the health benefits associated with THC & CBD and how they differ. .
Now that you know the difference between THC & CBD, I am going to share with you my personal story and how I used THC/CBD to FIRE Big Pharma once and for all. This is not my opinion based on interviews, research and studies but from real life experience living it first hand. I also own a business in the cannabis industry and hear amazing stories from thousands of our customers. My name is Robert Lockwood and I was hit by a semi truck on the freeway many years ago and ruptured a disc in my lower back. I was unable to work and provide for my family. I was bedridden and could barely crawl out of bed without being in excruciating pain. For anyone that has ever been there, you know how depressing and life changing this can be. I was taking Norcos and Ibuprofen 800 multiple times a day just to be able to get out of bed and play with my kids. I finally had enough of the pills and decided to quit taking them. IT WAS HELL..That was when I realized I was addicted to pain pills. My doctor wasn’t interested in curing me, just addicting me and he was winning. I was determined to quit taking pain pills and I decided then and there to never take a pain pill again. I started replacing my pain pills with THC and it worked. The only problem was that it made me a little foggy and not as clear headed as I wanted to be. However I knew that an all natural plant was much better than anything from Big Pharma. I really don’t think I could have done it without THC. I found this amazing and quickly learned to use both of them at certain times for different results. I would use a little THC to block the pain and then some CBD to get rid of the inflammation. The nice part about this was that the CBD not only got rid of the inflammation but also took away most of the high effect caused from the THC. This left me with a very effective, all natural way to ease my pain while being clear headed and best of all, not having to rely on pain pills ever again. I also found that CBD works much better for sleep than THC when taken right before bed time.. While THC makes you tired, it also keeps you out of REM sleep causing you to need more sleep and not to feel as rested. However, CBD relaxes and quiets the mind, allowing you to enter REM sleep quicker and to stay in it longer. I noticed that I woke up feeling more refreshed and with more energy with less sleep. So what I would do is take a little THC about 1 hour before bed and then take some CBD right before bed. I found that the THC would make me tired and fall asleep easier while the CBD put me into REM sleep quicker. And with NO PAIN, I sleep like a baby. As you can see, there are multiple benefits of THC & CBD and we haven’t even scratched the surface. Now that the world is waking up and realizing the possibilities of this amazing plant, we can start doing the research needed to unlock its true potential.